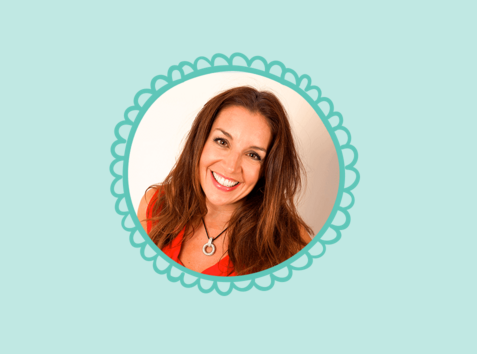 My children have asked this year if they can start receiving pocket money and to be honest, money is tight at the moment as we are saving for a family holiday and I wasn't too keen. Over Christmas though their pester power has worked and I have relented. Every parent is obviously different but I've decided to give the kids a maximum of £2.50 per week in exchange for various chores. Harry (aged 9) has decided he would like to save for a wii u and game. They aren't cheap at £200+ but he seems determined and I think encouraging a savers attitude from a young age can only be a good thing. Last year I was invited to lunch with Sarah Willingham (yes the Sarah Willingham from TV's Dragons Den) and the Experian team to put a new app they had been designing to the test. 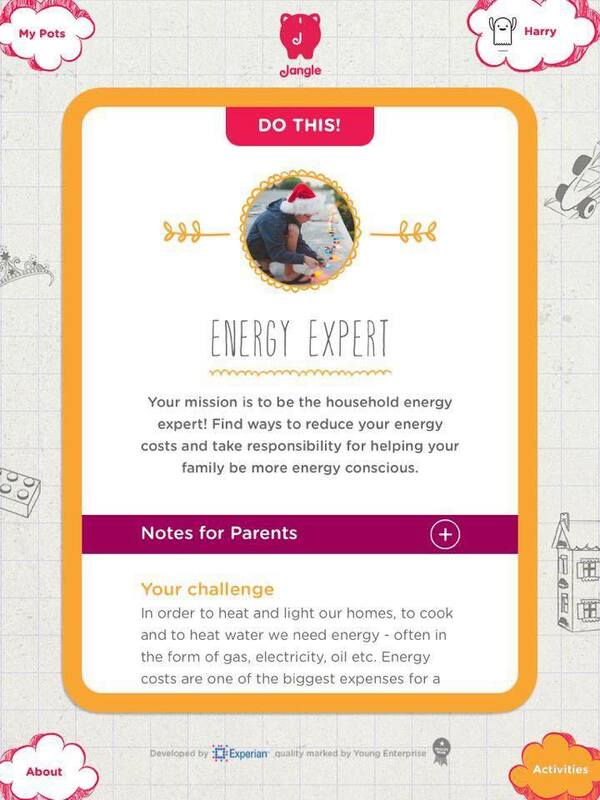 Although it was in it's preliminary stages, I was impressed with how the app encouraged money management in children and importantly - featured no adverts or in app purchases and was easy to set up and use with parental controls. 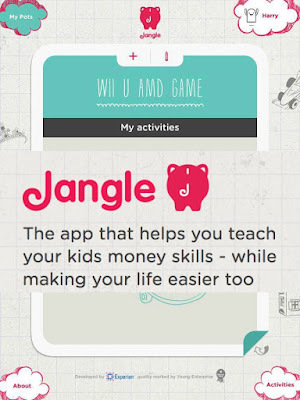 Now that the app is available to download on iPads (other devices coming soon) I knew it would be the perfect tool to help Harry manage his money and save for his Wii U.
Jangle is FREE with no pop up adverts or in-app purchases. Yeah! That is the first breathe of fresh air. I set up Harry's profile with him and created a pot of money for him to save towards (you can create more than one pot if you like). 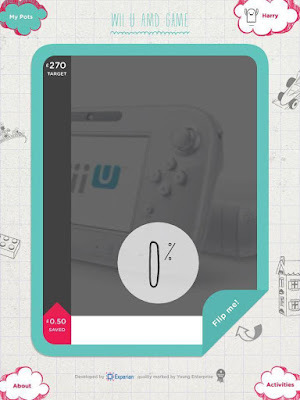 You can upload a photograph (or find one from google) of the item or experience you are saving for too which is a nice touch. Next, Harry could select a few tasks from the large selection in the 'activities' section of the app. The app is very easy to navigate and any child who can read should be able to find their way around without any problems. 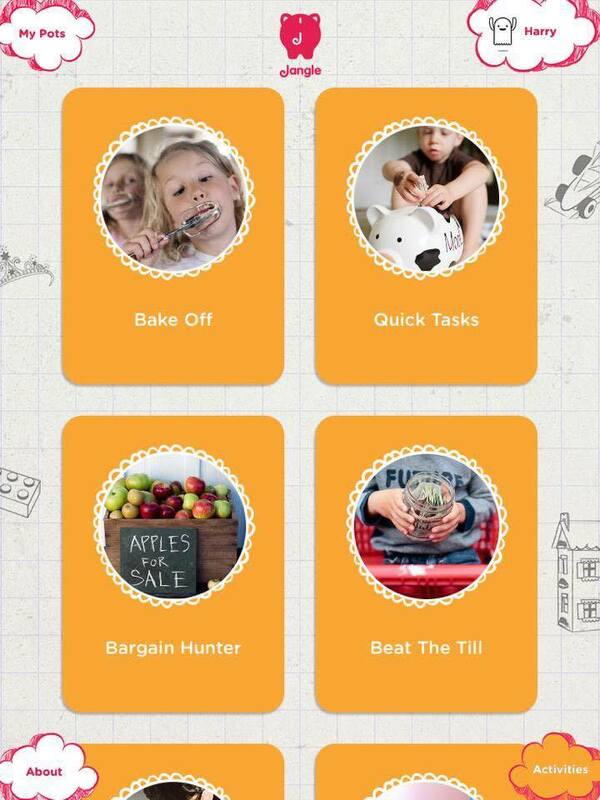 Activities range from quick tasks such as the washing up to longer tasks that require thinking and research. I particularly like the energy expert task which encourages children to find how how much we pay for our fuel and use price comparison sites to find us a better deal as well as researching ways in which the family can save money on our energy bill. There are over 30 tasks to choose from in total and many such as washing up or washing the car could be completed on a weekly basis. Once the children have picked their tasks for the week, a grown up must input how much they think that task is worth and enter their special grown up password to approve. For me, I think washing up is worth 50p. 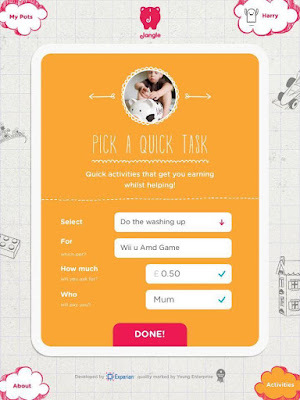 Once the task has been completed to the desired standard, mum or dad can check and then press complete (and enter their password) and a virtual 50p (or however much you have promised) is added to your child's pot of money. They can watch their pot grow from their profile. 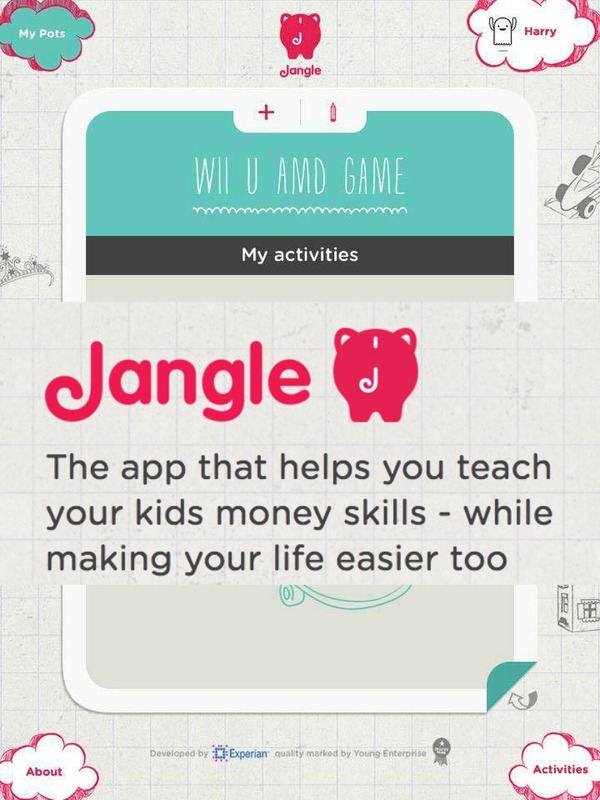 Personally, we have LOVED using Jangle, it is free, simple to use and teaches valuable skills. Harry is now much more willing to help around the house and after completing a few tasks has definitely been more aware of the cost of things (he even turns his bedroom light off when he leaves his room now). Agree a maximum limit your children can earn per week in advance otherwise. The activities are genuinely fun as well as educational and you don't want to end up in the situation where you are paying your children £20 per week. Encourage other family members to be involved too. Harry plans to take his iPad to grannies next time he visits to see if he can complete any chores for her. It is easier to use the app if you are sitting next to your child as you do need to enter your grown up password a few times. As a parent, it's great as when the kids are bored I can get them to complete a task in exchange for money even if I don't have any spare change in my purse. You can download Jangle and try it for yourself via the App Store here (where you'll find it has 5* reviews). Let me know if you do and what you think. Love the idea and the concept. hope its alll good when little daisy enough to get her pennies!